I am a historical geographer, & most of my work is explicitly historical or informed significantly by historical content. Thus far in my career, I have worked in multiple linguistic & cultural contexts & have employed a diverse range of methods & data in my research, ranging from ethnography, oral history, & survey-based approaches in the field to archival research at collections in Turkey, Europe, Latin America, & the United States. Trained broadly to research the Middle East & post-Soviet Eurasia, I focus particularly on 19th- & 20th-century geographies of late Ottoman & republican Turkey. Theoretically, my scholarship concerns dynamics of power & its diffusion amid society-state relations & processes of nation-building, modernization, & globalization/regionalization. 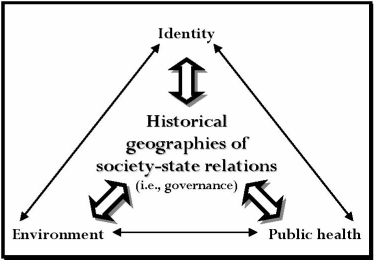 As a historical geographer, I work on matters of identity-place (i.e., cultural & political geography), geographies of health & well-being (i.e., medical geography), & environmental issues (i.e., cultural & political ecology & environmental history). Seemingly disparate sub-fields of interest, the research questions that I engage with are actually thoroughly integrated when viewed with regard to: (1) how states & societies frame & regulate their citizens’ identities, health conditions & sexualities, & ecologies and livelihoods; &, (2) how communities & individuals struggle to create & articulate their own associated narratives & spaces. How these issues extend into & enhance each other to constitute a unified program of research can be illustrated with three examples from my publication record. First, in working on identity-place matters within cultural-political geography (e.g., Turkish nationalism), I readily engage with associated nation-building projects involving health (e.g., malaria) & ecologies (e.g., poppy cultivation). Second, as I research Anatolia’s environmental issues, I readily encounter cultural-political challenges (e.g., wetland protection) & health concerns (e.g., malaria-associated reclamation). Third, as I research socio-spatial dimensions of disease in early Turkey, both institutional geographies of the early republic & environmental influences are omnipresent.